The Goddess War trilogy sets Greek gods in a modern world that no longer believes in them. More importantly, they're all dying. Desperate for a cure, or at least a way to survive her unhappy family's death throes, Athena and her brother Hermes have teamed up with some special humans. Not a horrible premise, right? In fact, I really enjoyed the first book, Antigoddess, and I was super excited for its sequel. Key word: was. Warning: there may be spoilers for Book 1. There is a war going on between gods. Let that marinate for a moment. WAR between GODS. This is the situation, yet somehow this whole book revolves around nothing but emotional and/or relationship angst. I'm not entirely sure what the author was trying to pull off, but the end result was this: the writing, plot and characters suffered. The plot jumps around the world at lightspeed, and everything feels arbitrary and is told instead of shown. The main characters are completely different people, and the secondary characters are little more than foils. Henry and Andy barely keep the story rooted in the normal world. Hermes is there to defuse conflict, make Athena worried and throw out the occasional line about liking "pretty boys" (which is such a 180 from his pining and grieving over the witch in Book 1, I got whiplash). Cassandra, instead of the sympathetic character she was, vacillates between two extremes: grief for her dead boyfriend and, more often, full of rage/hates everything and everyone/wants to kill all gods. She became a caricature. Athena is almost unrecognizable. Her complicated relationship with Odysseus was amusing and enjoyable in Book 1. Now, I am not amused. Ody's former girlfriend shows up and makes a love triangle; but worse, instead of being the untouchable, mildly conflicted goddess she was in Book 1, Athena likes/loves/wants Odysseus. Odysseus loves her. There's nothing in the way. Athena accepts that she has these feelings but doesn't want to act on them. Fine, except for the fact that she barely gives a reason why. There's no "because I'm the goddess" or "because I'm having an identity crisis" or "I'm afraid destroying my goddess rules will hasten my death" or something. No, it's just, I like you, you like me, but let's not, at least for this book. The whole thing feels so contrived, which basically sums up the whole book. Also, Athena's big "plan" was not worthy of the goddess of wisdom and battle, even one in an agitated, distracted state. It felt like lazy, contrived plotting, as if the author said, we just have to get to this point so this stuff can happen. On that note, none of the action/conflict made an impact or affected me emotionally. I wasn't worried about anyone. I didn't really care about them. 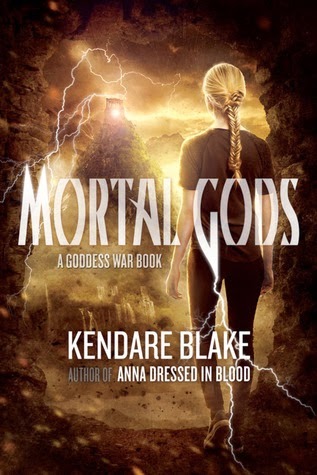 This was one of my most anticipated sequels and, while I'll probably read the next book and see how the author chooses to bring certain people back to life and/or explain the god-like powers of certain mortals, I am no longer super excited about this series. As Lady Catherine de Bourgh would say, "I am most seriously displeased." If you haven't already, don't forget to check out my post for the Gratitude Giveaway Hop, which ends November 30th. $10 book of choice from the Book Depository up for grabs! What a bummer. I think if I were to find book one at the library or online for free, I may still give it a go, but its way down the TBR list. I do hope, however, that you read book three and let us all know if it is worth it in the end!